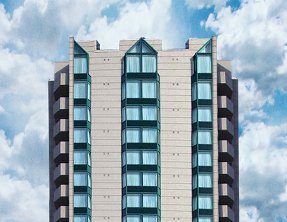 Ramada Niagara Falls is a mid rise, AAA/CAA approved, 3 star hotel located in the heart of Niagara Falls. The Ramada Niagara Falls was formerly known as the Falls Plaza Hotel. This Niagara Falls Hotel is only a short distance from Niagara Falls, Clifton Hill, the Fallsview Casino Resort and many other great attractions in Niagara Falls. The Ramada Niagara Falls features 192 modern, spacious rooms which are perfect for a honeymoon or quiet getaway. The units are fully soundproofed and have individual controls for heating and air conditioning. This hotel can play host to up to 100 people, perfect for corporate meetings and intimate gatherings. Ramada Niagara Falls Hotel (formerly the Falls Plaza Hotel) is located in the heart of Niagara’s Tourist District. Set in a magnificent, modern and attractive 11 storey tower, the Ramada Niagara Falls Hotel offers elegantly appointed guestrooms including 28 suites with Jacuzzi tubs and 12 unique specialty Fireplace/Jacuzzi suites. For the business minded, this Niagara Falls Hotel feature three meeting rooms and wireless Internet access. The hotel has free parking for registered guests. Niagara Falls is the hub of entertainment in the Niagara Peninsula. The Ramada Niagara Falls Hotel is ideally located near all of the attractions Niagara Falls has to offer and is only 2 blocks from the Falls themselves. The Ramada Niagara Falls Hotel offers a wide selection of the meeting rooms for any type of group. This hotel can play host to up to 100 people, perfect for corporate meetings and intimate gatherings. This hotel staff can also provide state of the art audio/visual support and complimentary Wireless High Speed Internet access in all meetings rooms.